James McMaster at McMaster Yachts tells me he's been appointed central agent for sale of Perini Navi's 45.26m sailing yacht Helios. Launched in 2007, Helios was built to a Ron Holland design and is ABS classed and MCA compliant. She is a great combination of a cruising yacht with excellent sailing performance and her versatile accommodation offers room for eight guests in a master, VIP and two twins that can convert into doubles. The interior of this superyacht is a pure classic, mainly fashioned from mahogany and mahogany briar. All this with a special effort by Joe Smullin, one of the world's premier acoustical engineers, makes Helios extremely quiet under all conditions. 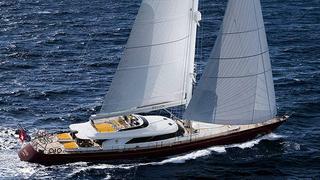 Currently in the Caribbean and back in the Mediterranean this May, Helios is asking €14.35 million.